Everyone in India has been expressing their anger towards the Pulwama terror attack which claimed the lives of 40 CRPF soldiers in Kashmir on February 14. Most of the celebrities have voiced their opinion against the deadly attack and many of them have also demanded a blanket ban on Pakistani artists. Kangana Ranaut, who has always been very vocal and expressive about her opinion, also shared thoughts on the ghastly attack. Sending out a press release, she was quoted saying, "Pakistan has not only violated our nation’s security they have also attacked our dignity by openly threatening and humiliating us, we need to take decisive actions or else our silence will be misunderstood for our cowardice. Bharat is bleeding today; the killing of our sons is like a dagger in our gut. Anyone who lectures about non-violence and peace at this time should be painted black put on a donkey and slapped by everyone on the streets." Kangana Ranaut Accused of Stalling Mental Hai Kya Shoot; Producer Denies Incident. She also bashed Shabani Azmi and went on to call her anti- national. “People like Shabana Azmi calling for halt on cultural exchange. They are the ones who promote Bharat tere Tukade honge gangs…. why did they organize an event in Karachi in the first place when Pakistani artists have been banned after Uri attacks and now they are trying to save face. Film industry is full of such anti-nationals who boost enemy’s morals in many ways but right now is the time to focus on decisive actions. Pakistan ban is not the focus, Pakistan destruction is." While we'd like to refrain from commenting on Kangy's take on the Pulwama terror attack and everything else she said about Pakistani artists, let us remind her that Kangana's movie Manikarnika: The Queen of Jhansi is still running in the theatres in Pakistan. We are also sure that she is well aware of the same. So why the double standards? 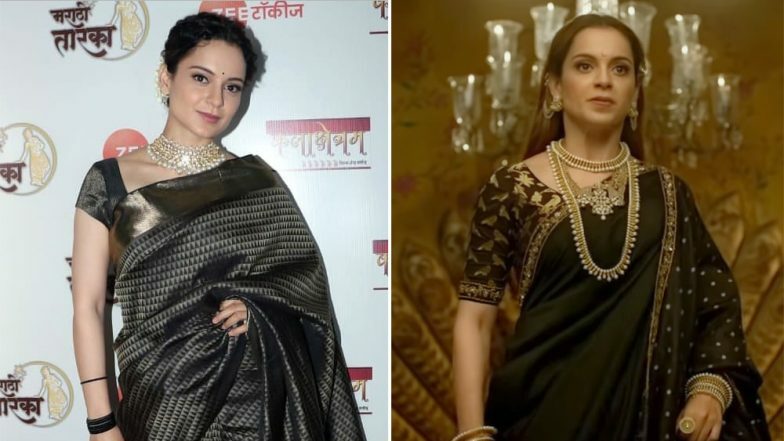 Pulwama Terror Attack: Shabana Azmi Reacts to Kangana Ranaut Terming Her 'Anti-National', Calls it Insignificant. Bollywood Hungama did some research and came to the conclusion that Manikarnika is still running in the theatres of Pakistan. As per their analysis, in Universal cinemas Lahore, Manikarnika – The Queen Of Jhansi has one show a day, at 10:45 pm. Meanwhile it has four shows in Cinepax multiplex, located in the Packages Mall of Lahore. At Cinestar ATC, it has 2 shows, one at 5:00 pm and the other at 10:00 pm. It also has one show each in Islamabad, Gujranwala and Hyderabad. We wonder what Kangana has to say to this!